It can be easy to get stumped in the kitchen with the plethora of greens that cooler months bring if you haven’t grown up eating greens regularly. 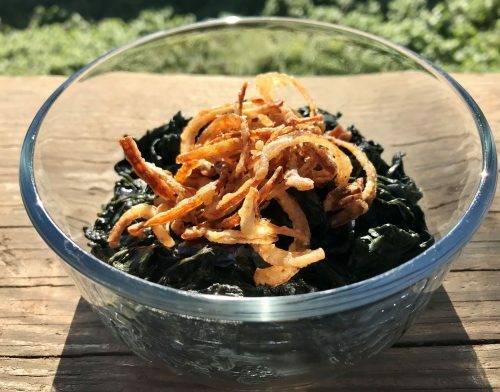 While we at Crabtree often find ourselves hauling out a food processor to make a delightful mustard greens pesto, the assertive bite of this leafy green can also be lessened by wilting and stirring it into a tasty creamy casserole topped with crunchy bits of fried shallots. While the shallots add amazing flavor, thinly slicing and substituting onions would also make for a fantastic dish. As for calling it a day and using a can of the fried onions more often seen topping green bean casseroles, we won’t judge ya. Heat the olive oil in a pot. Add the onion and cook over moderate heat--stirring until translucent for about 5 minutes. Add the greens in batches, stirring each batch to wilt before adding more. Add the stock and bring to a simmer. Cover and cook over moderately low heat until the greens are tender--about 15 minutes. Drain the greens well and return them to the pot. In a bowl, mix the flour with the cayenne and a generous pinch each of salt and pepper. Add the shallots and toss to coat with the flour mixture. Transfer to a strainer and shake to remove the excess flour. In a deep skillet, heat 1/2 inch of vegetable oil. Fry the shallots in batches over moderate heat until crisp for about 2 minutes. Using a slotted spoon, transfer to paper towels to drain. In a saucepan, simmer the cream and garlic over low heat until reduced to 1/2 cup, about 5-10 minutes. Strain the cream over the greens and simmer over moderate heat until very thick, 5 minutes. Add additional cream if the mixture dries out too much and taste and season with additional salt and pepper. If your greens are a bit bitter that flavor can be mitigated by adding some additional salt. Stir in one-quarter of the fried shallots and transfer to a serving dish. Sprinkle the remaining shallots on top and serve immediately. To Make Ahead: The stewed greens can be refrigerated overnight. The fried shallots can stand at room temperature for 4 hours or sealed in an airtight container for a few days (reheat them gently in a warm oven if they lose some of their delightful crunch).